Are you looking for the perfect Christmas party craft? These adorable ornaments are quick and easy for any age group. Another great thing about these ornaments is they come require very little actual artistic skill and they come out beautiful every time. This makes them a great choice for a party. 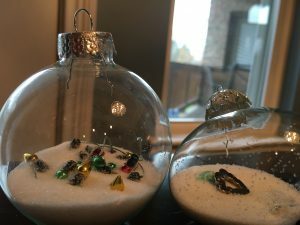 We started with clear glass ornaments in various shapes and added Epson Salts as the snow. 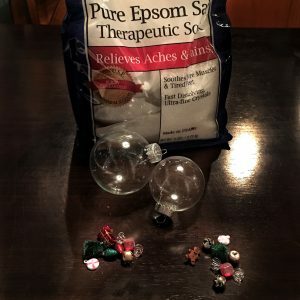 We prefilled the ornaments with Epson Salts for the snow. We filled the ornaments between 1/2 and 1/4 with the Epson Salts because some people prefer them with more snow and some with less. We prefilled because of the number of kids at the party and the age of some of the party attendees. 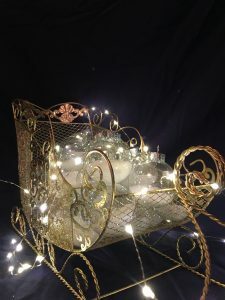 The prefilled ornaments also look beautiful in this golden sleigh and we used this as the centerpiece on the craft table. To create the ornaments, the party guests will select a few miniature items to add to their ornament. Add selected items to the ornaments. 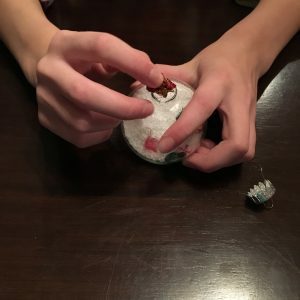 We found many of the choices in the miniature doll house sections of local craft and hobby stores, others we found on the Christmas ornament isle, and a few are even buttons. 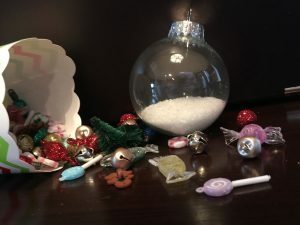 Some of the options in our mix are miniature Christmas trees, red and green beads, tiny candy canes, glass candies, golden bells, gingerbread men, tiny ornaments, etc. When purchasing the ornament fill be certain to get items that will fit through the opening of the ornament. The finished ornaments are so fun to see. Some kids will choose a theme, perhaps all candy, and others will have a very random assortment of goodies. I love how this craft not only allowed their personalities to shine, but also how every kids left the party thinking his or her ornament was the most beautiful one. 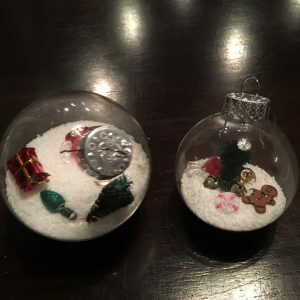 This craft is fun for all ages past the point a worrying about a choking hazard as the ornament fill is of that size. Older kids and even adults also love this craft.